Looking for a quicker, easier method of final bolt alignment when installing heavy equipment and setting structural steel? For more than 25 years we have been manufacturing anchor bolt sleeves here in the United States for the construction industry. Wilson Anchor Bolt Sleeves are the cost effective solution to anchor bolt alignment problems and have been specified by engineers for use in nuclear power plants, paper mills, and large manufacturing facilities. Our sleeves allow equipment and structural bolts to be installed correctly without risk of removing misaligned bolts. Additionally, Wilson Anchor Bolt Sleeves have been found to be useful where metal pipe is prohibitive due to rust or rot. Sizes range from 1/2" to 5" in diameter and special lengths from 4" to 48". Copyright© 2006. 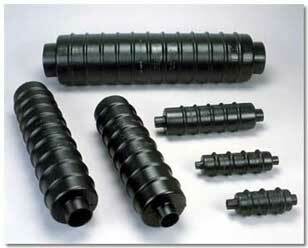 Wilson Anchor Bolt Sleeve Company. All rights reserved. Do not duplicate.